One of our most popular products. 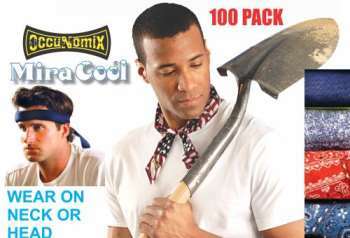 These neck coolers really work great! Just soak them in water for 20 to 30 minutes or so and wear it around the neck or forehead for continuous cooling relief for up to two days!! Turn them often for extra relief. MiraCools are great for work and play, indoors or out. If it's hot, you need one of these to cool down! Can be worn as a bandana or headband. 100 units - 1 Hang tag per package. Available Colors For This Package: Blue Denim, Cowboy Red, Cowboy Blue & Navy Blue.